With the European XGames just wrapping up in Tignes, the next place with some action is just up the road in Val D’Isere. 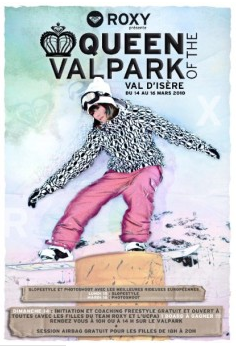 Lucy Paltz has been hard at work organising the Queen Of The ValPark girls slopestyle invitational, it’s set to be another great time I’m sure. Last years comp was brilliant fun and with a very impressive rider list, this year is setting the standard even higher. The concept is a fresh one, you need to have a partner to compete with and each team will be judged together, with the winning 3 teams going on to ride in the photosession the next day.